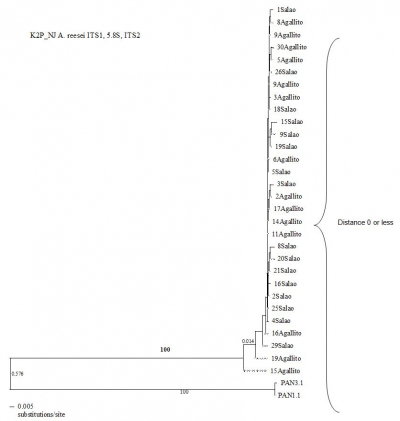 Sequence Analysis Of 5.8S Rdna And Internal Transcribed Spacers Of The Ribosomal Region Of Americonuphis Reesei (Polychaeta: Onuphidae) In The Republic Of Panama. First Report. M Cano, K De León, N Herrera, C Ramos, O M Chen, O Duran, C Ciniglio, C Aguilar, J A Gómez, J Villalaz, M Sánchez de Chial. 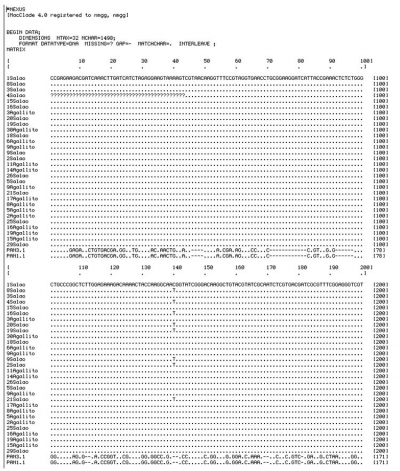 Sequence Analysis Of 5.8S Rdna And Internal Transcribed Spacers Of The Ribosomal Region Of Americonuphis Reesei (Polychaeta: Onuphidae) In The Republic Of Panama. First Report.. The Internet Journal of Genomics and Proteomics. 2014 Volume 7 Number 1. Specimens of the polychaete Americonuphis reesei from two locations in the Pacific Ocean off the coast of the Republic of Panama were examined by sequencing of the internal transcribed spacers (ITS1 and ITS2). The complete sequence of the 5.8S ribosomal DNA (rDNA) was obtained and the 3’ end of the 18S rDNA and 5’ end of the 28S rDNA were also determined. Neighbor-joining analysis of ITS variability indicates a close relationship between the two populations of Americonuphis reesei. Americonuphis reesei belongs to the Onuphidae family of the phylum Annelida. This species consists of individuals that live in a thick mud-walled tube; they are carnivorous and extend out of the tube to trap their prey (Villalaz, 1997). A. reesei is harvested and used locally in Panama to provide feed for the culture systems of penaeid shrimp (D’Croz et al., 1988, Spadafora, 1994). Because these shrimp are a species of key economic importance in Panama, extensive studies of A. reesei concerning their ecology, embryology and physiology have been performed (Luna et al., 2001; Villalaz et al 2001). A. reesei is found in two locations in the Gulf of Panama, Republic of Panama: one in muddy bottoms at a depth of 27 meters and the other in the sandy bottoms of an intertidal region (Fauchald, 1973). Two populations from the intertidal region have been selected for phylogenetic comparison in part on the basis of a different morphology, namely their reproductive period (Luna et al., 2001). A. reesei has previously been characterized using morphological markers (Fauchald, 1973; Luna et al., 2001 ) and phylogenetic studies of this species have not yet been reported. However, phylogenetic studies of other species of annelids belonging to the families Tubificidae, Dorvilleidae, Syllidae, Eunicidae, Onuphidae and Hartemanniellidae have been conducted using molecular markers such as 18S ribosomal DNA (rDNA), as well as 16S mitochondrial rDNA (Dahlgren et al. 2001; Struck et al. 2002; Nygren y Sundberg 2003). Additionally, randomly amplified polymorphic DNA (RAPDs) and internal transcribed spacers (ITS1 and ITS2) of rDNA have been used to genetically characterize cryptic species of annelids, such as Petitia oculta (Westheide and Hass-Cordes, 2001; Meyer et al. 2008). In this study we analyzed the sequence of the region of rDNA spanning from the 3’end of the 18S rDNA, including ITS1, ITS2, and 5.8 rDNA and ending at the 5’end of the 28S rDNA of A. reesei from two localities off the Pacific coast of the Republic of Panama. The polychaetes were collected by hand from Agallito beach in Herrera Province and El Salao beach in Coclé Province, which are both located on the Pacific side of the Republic of Panamá. A total of 25 A. reesei specimens, 15 from the Salao population and 10 from the Agallito population were examined by ITS analysis. Genomic DNA was extracted from the polychaetes as previously described, with small modifications (Chen and Yu, 2000 and Chen et al., 2002). Specifically small pieces of tissue were transferred to lysis buffer (0.4 M NaCl, 200mM EDTA, pH 8.0) and then incubated at 65°C for 30 minutes. Proteinase K was then added to the sample at a final concentration of 0.1 mg/ml, and samples were incubated at 55°C for 3-4 hours. After centrifugation at 12000 rpm for 10 minutes, the supernatant was extracted with equal volumes of phenol/chloroform, and DNA was precipitated overnight at -20°C with absolute ethanol and 0.3 M sodium acetate. The samples were centrifuged at 12000 rpm for 15 minutes, washed with 70% ethanol, resuspended with distilled water and stored at -20°C. PCR reactions were set up as previously described (Chen et al., 2002). The forward primer, 5’-GGTACCCTTT GTACA-CACCG-CCCGTCGCT3’ annealed to the 3’ end of the 18S rDNA and the reverse primer, 5’GCTTTGGGCT-GCAGTCCCAAG-CAACCCGACTC-3’ to the 5’ end of the 28S rDNA. PCR products were purified using a QIAquick PCR purification kit (QIAGEN, http://www1.qiagen.com). For direct DNA sequencing, both primers described above were used, along with two internal primers. The internal primer sequences were, 5’ CGATGAAGAG CGCAGCCAGC-3’ and 5’ CGATGTTCAA TGTGTTCTGC3’ (Chen et al., 2002). Direct sequencing of PCR products was carried out using ABI PRISM, Big Dye Terminator v3.1 as described by the manufacturer (Applied Biosystem). Samples were run on the Genetic Analyzer ABI 3130XL (Applied Biosystem) at the Molecular Biology facilities of the Smithsonian Tropical Research Institute (Panama). 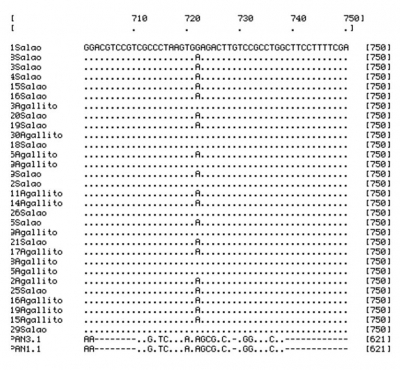 The sequences were verified and aligned using Sequencher 4.7 (Gene Codes). Phylogenetic analyses were performed using the CLC sequence viewer version 4.6.2. and PAUP 4.10 (Swofford, D. L., 2002). Distance analysis was conducted using the neighbor-joining (NJ) option employing the Kimura 2-parameter (K2P) distance. A sequence of approximately 1200 nucleotides, which spanned from the 3’ end of the 18S rDNA to the 28S 5’ end of the rDNA and included the 5.8S rDNA, ITS1 and ITS2, was amplified from 15 samples of A. reesei of the Salao population and 10 samples of the Agallito population. Both strands were sequenced. In both A. reesei populations, the 5.8S rRNA gene was 154bp in length and identical in sequence. The ITS1 among all individuals had almost the same sequence and was 364 bp in length. The ITS2 length among all individuals was 288 bp, and almost the entire sequence was identical. Three single base exchanges were observed in ITS1 and ITS2 combined. At position 140 (ITS1), eight samples from El Salao have a T instead of a C (transition) (Fig1a), and four samples at position 454 (ITS1) have another single change, again a T instead of the C (transition) observed in the rest of the samples (Fig.1b). At position 722 (ITS2) we found the third single base change, eleven samples (5 from El Salao and 6 from Agallito) have a G and 19 samples (11 from El Salao and 8 from Agallito) have an A in this position (transition) (Figure1c). Nucleotide composition observed in both ITS 1&2 showed a higher content of G+C (55.5%) than of A+T (table 1). Sequence data of one specimen from the El Salao localition was deposited in Gen Bank (accession number 1190451). To ascertain whether sequences obtained from PCR products were consistent with the polychaeta origins of this specie; we compared the 3’end of the l8S rDNA and the 5’ end of 28S rDNA of our A. reesei with other polychaeta taxa obtained from Gen Bank. They were similar to the 3’end of 18S and the 5’end of 28S of Perinereis aibuthitensis, (shown in Figure 1). Both the sequence alignment and the phylogenetic tree demonstrated a close relationship between specimens from both populations. The distance determined by the analysis showed that the two populations are identical and thus belongs to the same species. The K2P distance between samples from these two locations is 0.024% and the Fst values were negative, which explains the lack of differentiation between locations and suggests that not enough time has passed for genetic differentiation to occur. Polychaete taxonomy has traditionally been performed by using phenotypic differences, specifically via morphological markers as observed by light microscopy (Westheide and Schmidt, 2003). In addition to this methodology, molecular markers such as ITS1 and ITS2 of the ribosomal region have demonstrated that Petitia oculta, which had previously been regarded as a cosmopolitan species and phenotypically indistinguishable, was shown genotypically to consist of cryptic species (sibling species) (Westheide and Hass-Cordes, 2001). On the other hand, ITS1 and ITS2 analyses have confirmed a cosmopolitan distribution of the species Proscoloplos cygnochaetus (Meyer, 2008). A. reesei have previously been characterized using species-specific morphological markers (Fauchald, 1973). To our knowledge this is the first report of molecular characterization of this species using ITS molecular markers, although ribosomal ITS have previously been used for phylogenetic analyses of other polychaetes. One of the advantages of using ITS1 and ITS2 in phylogenetic studies is that the length of sequences for each of the regions is less than 1000 bp in both plants and animals (Chen et al., 2002). Universal primers were used in this study, which give an advantage for use in PCR and sequencing, because they are capable of amplifying the ITS region from species of Perinereis and Proscopoplos as well (Chen et al., 2002; Meyer et al, 2008). Using these universal primers, we successfully sequenced the ITS1 consisting of 364 bp and the ITS2 of 288 bp. Compared with the ITS length of other polychaetes, there was very little variability in the size of the ITS regions. For instance the ITS1 and ITS2 of species of Perinereis were between 348 and 375 bp and between 304 and 325 bp respectively (Chen et al 2002), ITS1 being larger than ITS2. Petitia species also showed ITS2 of different lengths depending on the population. For the Seychelles population (Mahé Island) the ITS2 was 510 bp in length, compared with the Rhodes population (Mediterranean) that was 428 bp (Westheide and Cordes, 2001), both of them larger than the ITS2 of A. reesei. The ITS1 sequence of A. reesei showed two transitions compared with other species such as Petitia oculta, where the ITS1 sequence was identical for all populations studied (Westheide and Cordes, 2001). The 5.8S rRNA gene of both A. reesei populations is identical in sequence, which is similar to reports of other studies in species such as Petitia oculta and Ctenodrilus serratus (Westheide and Cordes, 2001, Westheide et al., 2003). The length of the 5.8S gene is 154 bp, which is slightly smaller than in other species of Perinereis previously described that were reported to be 155 bp (Chen et al. 2002). The ITS2 showed one single base exchange (transition G-A) in both populations and this pattern of base exchange has been reported in Petitia species with variable bases at different positions between populations and the same holds true for Ctenodrilus species in which ITS2 showed single base exchanges (Westheide and Cordes, 2001; Westheide et al., 2003). ITS have been used successfully to determine interspecific and intraspecific species (Westheide, et al., 2003; Chen et al., 2002). However, there is no genetic distance between the two populations of A. reesei in this study, since the sequences of both ITS1 and ITS2 showed a minor difference only. Thus the phylogenetic analyses obtained by NJ, K2P and parsimony methods produced a similar relationship between the two populations, boostrap supported that this is a monophyletic group. This indicates that the same species is present in both localities and agrees with our data that A. reesei has a wide geographic distribution in Panama. Although the two populations in this study showed a different spawning season (Luna et al., 2001) it possible that these differences are due to different geographical locations and not due to genetic differences. We thank the editorial team at Sustainable Sciences Institute for their help with reviewing and editing this manuscript, especially Dr. Jennifer Kyle. Phylogenetic relationship obtained from 1168 bp sequence comparison from ITS1, 5.8S and ITS2. The tree was obtained using the neighbor-joining (NJ) option of the PAUP, employing the Kimura 2-parameter distance. Chen, C.A., and Yu, J-K. 2000. Universal primers for amplification of mitochondrial small subunit ribosomal RNA-encoding gene in scleractinian corals. Mar. Biotechnol. 2: 146-153. Chen, C. A., Chen, Ch.P., Fan, T.Y., Yu, J-K., and Hsieh, H-L. 2002. 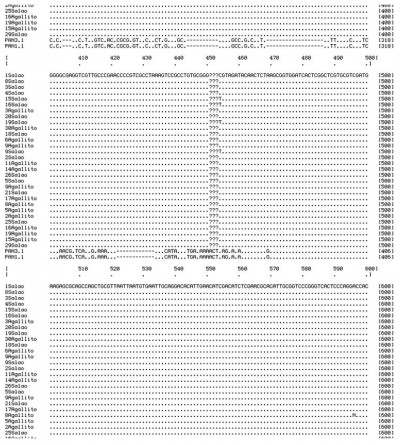 Nucleotide sequences of ribosomal internal transcribed spacers and their utility to distinguish closely related Perinereis polychaets (Annelida; Polychaeta, Nereididae). Mar. Biotechnol. (4): (17-29). D’Croz, L., Wong, L., Justines, G. y M. Gupta. 1988. Prostaglandines and related compounds from the polychaete worm Americonuphis reesei. Fauchald (Onuphidae) as possible inducers of gonad maturation in penaeid shrimps. Rev. Biol. Trop., 36 (2a): 331-332. Dahlgren, T.G., Akesson, B., Schander, C., Halanych, K.M. and Sundberg, P. 2001. Molecular Phylogeny of the model Annelid Ophryotrocha. Biol. Bull. 201: 193-203. Doyle, J.J. and Dickson, E. 1987. Preservation of plant samples for DNA restriction endonuclease analysis. Taxon 36: 715-722. Fauchald, K. 1973. Polychaetes from Central American sandy beaches. Bulletin of the Southern California Academy of Sciences, 72(1): 19-31. Fauchald, K. 1977. Polychaetes from intertidal areas in Panama, with a review of previuos shallow-water records. Smithsonian Contributions to Zoology. Nº 221. Hwang, U.I-W. and Kim, W. 1999. General properties and phylogenetic utilities of nuclear ribosomal DNA and mitochondrial DNA commonly used in molecular systematics. The Korean J. of Par. Vol. 37(4): 215-228. Luna, I. G. y López, I. E. 2001. Aspectos de la alimentación, regeneración y comportamiento de la construcción de los tubos del poliqueto Americonuphis reesei. Scientia (Panamá). Vol. 16(2): 7-13. Meyer, A., Bleidorm, C., Rouse, G.M and Hausen H. 2008. Morphological and molecular data suggest a cosmopolitan distribution of the polychaete Proscoplos cygnochaetus Day, 1954 (Annelida, Orbiniidae). Mar.Biol. 153:879-889. Nygren, A. and Sundberg, P. 2003. Phylogeny and evolution of reproductive modes in Autolytinae (Syllidae, Annelida). Molecular Phylogenetics and Evolution 29: 235-249. Spadafora, A. 1994. Evaluación preliminar de la extracción del recurso poliqueto en el área de Aguadulce durante los meses de octubre, noviembre y diciembre de 1994. Ministerio de Comerio e Industrias. Struck, T., Westheide, W. and Purschke, G. 2002. Progenesis in Eunicida (“Polychaeta,” Annelida)- Separate evolutionary events? Evidence from molecular data. Molecular Phylogenetics and Evolution 25: 190-199. Villalaz, J. 1997. Los Poliquetos Marinos. Tabla de mareas. Villalaz. J.R., Muñoz, E.A. y Gómez, J.A. 2001. Determinación de las proteínas en el poliqueto Americonuphis reesei en las playas El Salado, Aguadulce y Agallito en Chitré. Scientia (Panamá), Vol. 16(2): 29-36. Westheide, W. and Hass-Cordes, E. 2001. Molecular taxonomy: description of a cryptic Petitia species (Polychaeta: Syllidae) from the island of Mahé (Seychelles, Indian Ocean) using RAPD markers and ITS2 sequences. J. Zool. Syst. Evol. Research 39: 103-111. Westheide, W., Hass-Cordes, E., Krabusch M. and Muller, M.C.M. 2003. Ctenodrilus serratus (Polychaeta: Ctenodrilidae) is truly amphi-Atlantic meiofauna species-evidence from molecular data. Mar. Biol. 142(4): 637-642. Williams, J. G. K.; Kubelik, A. R.; Livak, K. J.; Rafalski, J. A.; Tingey, S. V. 1990. DNA polymorphisms amplified by arbitrary primers are useful as genetic markers. Nucl. Acids Res. 18: 6531- 6535.